In 1996 the Iowa City City Council adopted a traffic calming program to help neighborhoods manage rising traffic volumes and speeds. Traffic calming is the practice of trying to manage speeds and/or volumes of traffic on residential streets using one or more approaches: increased police enforcement, education, or physical changes to the roadway. Each of these approaches has its appropriate application, and combined they can help reduce unwanted cut-through traffic or reduce speeds on neighborhood streets. Increased police enforcement is effective at targeting high speeds during specific times. However, the police department does not have sufficient resources to provide continuous enforcement over a sustained period in all neighborhoods. Therefore, while speeds are rapidly reduced with an officer present, they also return to their previous level when the targeted enforcement moves to other areas. The police department does select specific streets to enforce each month. Education is the process of making drivers aware of their speeds in relation to the neighborhoods they are traveling in. Several programs are being used to notify drivers of their responsibility to obey traffic laws. One example is the "Share the Road" sign to identify that both bicycles and automobiles have rights and responsibilities while using the roadway. Another program that includes signs as well as TV commercials is the "Check Your Speed" program to alert drivers to watch their speeds in residential areas. To help control excessive speeds or unwanted cut-through traffic, physical modifications can be made to a roadway to force cars to slow down, or to deter unnecessary traffic. These physical changes can be as simple as on-street parking and planting trees between the sidewalk and curb, to constructing diverters to force traffic to go one way or another. Some of the alternatives are shown on the drawing below. Other alternatives are available and each application is custom designed to meet each neighborhood's individual needs. Following is a copy of the City's adopted traffic calming policy. The most important thing is that the residents of the neighborhood need to be involved in the process. City staff would be happy to meet with your neighborhood to explain in more detail some of the issues associated with traffic calming. 1. To initiate a traffic study of the street proposed for traffic calming, a formal request is required from the neighborhood association that includes the street proposed for traffic calming, or a petition from residents along the street proposed for traffic calming. 2. 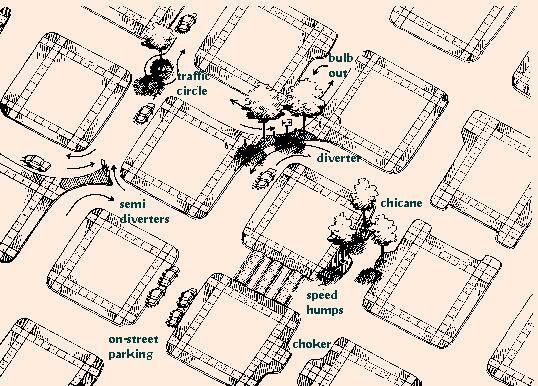 The street considered for traffic calming measures should be a residential street or a collector street. 3. Traffic volumes on a residential street should exceed 500 vehicles per day and on a collector street 1,000 vehicles per day. Traffic volume on any street proposed for traffic calming should not exceed 3,000 vehicles per day. 4. The measured comfortable speed of drivers should exceed 5 m.p.h. over the posted speed limit. 5. Staff will meet with the neighbors and determine which traffic calming measures are responsible for evaluation. Staff will conduct a traffic study which will include evaluating the potential traffic problems, roadway geometry, and the impact on adjacent streets ( traffic diversion ) from the proposed traffic calming measures. The objective of the design shall be to reduce the 85th percentile speed to the speed limit. 6. The police Department, Fire Department, ambulance service, and Transit Department will be asked to comment on the proposed street modification. 7. If the traffic study shows that traffic calming measures can be implemented safely, a mail-back survey of all affected residential dwelling units will then be conducted by the City. A proposal for traffic calming must be supported by a simple majority of the residential dwelling units responding to the questionnaire in order to be considered for implementation. 8. The City Council shall make the final determination regarding the appropriateness of a traffic calming project based on traffic information, neighborhood support, staff reccomendations and other factors deemed pertinent.